If you are an above ground pool owner, you’ll want to consider the safest and most practical entry and exit passage for your pool. This is especially true if there are children, the elderly or persons with disabilities using the pool. Below we’ve attempted to give you some tips and advice for purchasing the right pool ladder for you together with reviews of some of the best products available. Thinking about safety? 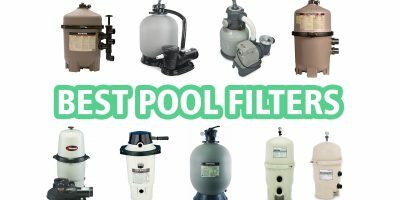 Be sure to also check out our article on Pool Covers explaining which covers qualify as Safety Pool Covers and another one reviewing the best Pool Alarms and Pool Gate Alarms. If you own an above ground pool that does not have a deck, it will profusely benefit from this A-Line ladder. It features a steel frame that is rust resistant, making it one of the most durable ladders out there. This model provides a safe entry and exit from the pool since the treads are slip-proofed to enable kids and the elderly have a secure footing. It bears rubber handles which enforce stability from inside and outside of the pool; thus you are protected from a wobbly base. With this A-Line ladder, you are assured of safety even for the heavier persons. It holds a weight capacity of over 300 pounds. The younger generation will find it fun jumping up and down this ladder, as it is made to withstand high impact activities without slipping from the rails and causing accidents. 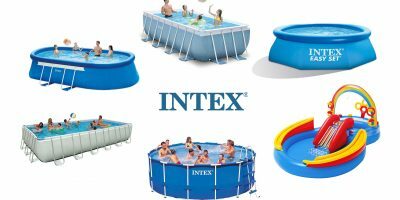 For your Intex pool that measures 48 inches high, this is the perfect fit as it will go both ways and still have a stable landing. This ladder is easy to assemble; hence you’ll have yours up and working in minutes. Confer is best known for its high-quality, affordable products. This A-line ladder lives up to our expectations by being a very convenient piece. Firstly, the treads are comfortable and safe; they’ll fit your feet such that your foot is flat against it for added stability. These treads measure 18×5 inches, so they are large enough to fit two people standing side by side, plus they offer a comfortable stride, so you’ll not trip and fall trying to get onto the next step or feel induced to take two steps at a time. You’ll appreciate the adjustability of this ladder; it can fit pools with a depth of between 48-56 inches and features sturdy handrails that enable even kids to get out of the pool easily. It also comes with a non-skid platform that positions itself above the pool rail; hence it provides a safe way of exiting the pool. Another anti-slip platform is at the base of this ladder, affording a stable footing when stepping on the steps. This ladder flips up and rolls to lock into place to prevent unauthorized entry. This will protect kids who need watching from sneaking into the pool without an adult around. It also fits against the interior walls such that it does not leave spaces where children may slip under and get stuck. It is the safest option for when you have sneaky kids around. 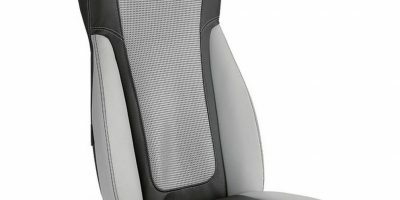 Featuring a robust design, Confer presents yet another valuable model. It is ideal for above ground pools with external decks for an easy and safe entry and exit for your pool. It features a flat base to fit flat-floored pools of up to 54 inches high. The steps are practically indestructible made from strong resin that holds up to 250 lbs. It is so simple to install this ladder and start using since the parts do not require a professional to help assemble. You’ll find that the user guide is easy to follow and you can have it working in less than two hours. Made of smooth sides, this ladder protects the pool liner from damage. It also features double hand rails to support kids, the disabled and elderly persons when getting out of the pool. This ladder is practical in that it does not require a barrier to hold it under water; instead, you just screw it into the deck, and its weight filled with water keeps it stable in the pool. The rungs feel like sand paper that act to help you or your kids from slipping. They are also wide enough for adults without being large for children. You’ll be surprised at how durable it is, coated with an anticorrosive material; it stays as good as new even in salt pool water. This quality will save you money from replacing old rusty ladders every summer. Additionally, it does not require an anti-entrapment barrier since it lies horizontally against the pool, leaving no room for anyone to slide under. Another unique feature that occasionally slips us is the fact that it keeps the water in motion by making a barrier so that as water runs through it, algae cannot have a stable ground for growth. To install it on a deck that’s above 60” high, you will need to get some ladder risers. The manufacturer, Confer Plastics provides this option. This is another exceptional in-pool ladder by Confer. This model is constructed from robust vinyl resin, which can withstand pressure from high-impact activities like jumping, or hold heavy weight. This one can take up to 300 lbs., which is an important aspect when choosing a ladder for heavier users. The hand rails are 18inches wide and double sided such that two people can simultaneously use this ladder together. It fits in pools by screwing in the deck, where the deck also acts as a platform to provide a stable footing when getting in and out of the pool. You’ll find that the base lands safely at the bottom when filled with water. It does not skid or exude any signs of destabilization. This ladder is adjustable to fit pool decks from 48-54 inches deep; hence it’s flexible for your above ground pool whose rail is somehow below the deck. It also features an entrapment barrier so that no one gets under the ladder. This is important especially in exercising extra care for kids. When you follow the instructions for putting up this in-pool ladder, you’ll find that it is so easy to follow through and get yours working in a matter of hours. Storage for this ladder also comes easy too, as disassembling is not complicated either. Many users find this ladder a good option as it is reasonably priced and delivers good results over a long time. Since it does not corrode or rust, you’ll conclude that it will last through many summers. This product by Main Access Entry Systems is a hybrid of steps and a ladder integrated into one system to offer ultimate pool security. You’ll grow fond of the pool when you remember no more skidding and accident risks even for your kids who love the pool as much as you do. This design by Main Access Entry Systems is growing in popularity for the varied benefits it offers users. You’ll find that this system is built from durable material that is heavy-duty, allowing even heavier users to access the pool without risking it may give under their weight. You’ll notice that it can hold up to 300 lbs. without destabilizing or showing signs of bending. With this ladder, you get a design that fits well with pools with a depth of up to 54 inches without floating. The steps are heavier and go into the water; hence they are ideal for just sitting in the pool. They are wide enough to offer a sound footing so that every step is not a struggle. It also features rugged hand rails for appropriately lifting yourself when exiting the pool. The sides of the steps also have spaces for flowing water through so that algae may never have a chance to build up. These steps also fit closer to the pool interior, leaving no room for any swimmer to get under the steps. It’s ideal for pools without a deck since the ladder stays on the outside, and there’s a platform where it joins the steps, so there’s no need to screw in the steps or the ladder to the pool. With the price it comes with, we highly recommend it for persons who require extra stability for their pool. Combining steps and ladders into a pool entry system is an idea to take into consideration seriously. Especially when having elderly users in your pool. Take it as double safety for your pool. Confer brings together steps and a flip ladder to give the pool experience a whole new meaning. The horizontally laid design means even kids can get themselves safely into the pool. Stairs in the pool provide not only a safe footing but also a place where swimmers can sit in the water to just relax. It’s an elegant design, meant to flatter your pool, while also creating a safe environment for every user. 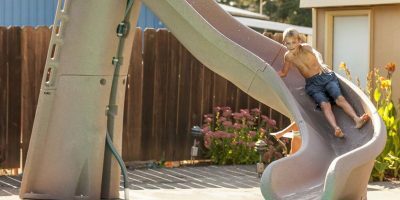 The outer ladder makes it easy to get into the pool without much hassle, while the insteps provide a large stable space with non-skid rungs which helps one stride comfortably from one step to the other. The flexibility of this design is further emphasized by the fact that you can flip up the ladder to prevent unsupervised and unauthorized users from accessing the pool. This convenience is true, especially for children. The steps are 24 inches wide; hence they are good enough for heavy users to comfortably step up or down, with support from the hand rails. They come in handy when one needs to pull themselves up and out of the water. They also feature side openings which are important in letting water through to prevent the onset of algae growth. You’ll love that it’s rust resistant, and it’s built to withstand the extremities of the outdoors, especially from the scorching sun, rust and salt pool water. Although a bit pricey, it supports over 300 pounds and can fit up to 60 inches deep pools. Assembling of parts is easy, and since it is corrosion resistant, it makes up a durable piece. Your kids will love you, even more, when they see this fabulous set gracing their pool. Swim Times gives us an excellent way to keep your pool safe while still looking bright and beautiful. With the alternating ways of setting this set, you can safely put the ladder in the pool while the steps create a safe space for getting into the pool. This is a classic for above ground swimming because you can mount it even without a deck to screw. It goes over the pool creating an excellent platform where the bridge is supposed to be. You’ll take as many photos as you like on this platform because it is stable to hold weight up to 300 lbs. without being wobbly. This idea is executed to get even your parents into the water. They will feel secure holding onto the handrails without sliding. This is because a rugged material makes the rails; hence they are safe to use in the hot weather, seeing that they are insulated and won’t get so hot. They are also built from anti-rust polyethylene material so that they can last for years looking as good as new. You’ll appreciate the anti-slip rungs which come in handy when getting out of the pools with very wet feet. They do not also become slimy underwater since they keep the water in motion, such that algae do not grow on the treads. You’ll find that children and handicapped swimmers will get safely into the pool, making this set a must have, now that you plan to install a new pair of pool entry system. With all the necessary qualities that provide optimum pool safety, this set is also very inexpensive. It proves that it can be an excellent pool safety accessory for all users. When considering an entry system to your above ground pool, you’ll want to consider this extensive set by Ocean Blue. Offered in a 30-inch wide and a 38-inch wide version, the capabilities are endless, and the safety features meet the needs of every pool owner. Firstly, the design is robust, which can withstand high-impact activities and a weight capacity of 300 pounds. It is best suited for flat bottomed pools to ensure the base stays flat. The ladder is heavier and goes on the inside, saving you inside pool space, in case your pool is not very large. The treads are anti-slip constructed of a rugged material that keeps feet from skidding and splashing back into the water. Once you assemble this set, you can stabilize it by adding sand and carefully placing the ladder into the water. Some users indicate that you can alternate the two and still acquire the safety levels you require. The steps feature two extended hand rails that are efficient in helping kids and the elderly get into the pool. This is important in giving the added support they need even when supervising adults are not there with them. They are also curved such that there’s ample space between one step and the next so that you can take your time while getting into the pool, thereby reducing the risk of accidental mis-steps. For above ground pools without decks, this set will fit perfectly, especially when your pool is 48-54 inches deep. What’s more, this design is height adjustable, and you can put the steps in so that you can lock the ladder to prevent unwanted access to the pool. The fit is closer to the walls such that it does not require an entrapment barrier to keep kids away from swimming under the ladder. This set is versatile and meets a lot of safety features for any above ground pool. It is easy to assemble and will make your pool much safer. Seeing that it is fairly priced for its qualities, you are sure to have it grace your pool for such a long time. There have been isolated complaints of having to unscrew the ladder to detach it from the steps. As such they make a preference to bolts since the holes may lose the ability to hold on to screws after years of use. This entry system by Main Access failed to meet customers’ satisfaction and therefore does not make it to the top best. Users indicate that the rails started showing rust in as little as two months after purchase. This pauses danger for it is prone to breakages and accidents. The material that makes this piece needs a lot of maintenance such as by constant painting, but this does not help the underlying problem of low-quality material. The steps have been seen to wobble under light weight; hence they cannot hold up heavy swimmers. Users have also complained about the poor packaging and confusing instructions. We are raised to believe expensive items exhibit high quality, but for this product, the opposite is true. It displays a disarray of some kind that needs attention by the manufacturer. First, it indicates that it comes with a padded liner, but most deliveries have come without. Customers have expressed disappointment in the sharp bottom that pierces and causes damage to vinyl lined pools. Other swimmers have indicated how unstable it gets, even after being fastened to the deck. Many pool ladders have a means of stabilizing them, either with water or sand, but some will not stop floating. That is why a good anchor will help keep the ladder stable. This is a one-piece cast bronze 4-inch deep anchor. It is best for both in the pool and outside of the pool ladders because it does not rust and is corrosion resistant. It comes with ground screws for fastening and is ideal for pools whose ladder rails are 1.9 inches in outer diameter. Alternatively, it is also offered in stainless steel. It is heavy-duty and will immensely hold your ladder down, especially when you drill it into concrete for ample support. It is very affordable for adding an extra measure of security for users in your pool. You may need an expert to install this anchor for you as it may involve some extra work. You do not want to do it yourself then end up in a worse situation. It’s important to consider how many of these anchors you’ll need since some ladders come with two poles. A safety pad for pool ladders and steps is reliable in preventing tears made by entry systems installed directly into pool interiors. They help maintain the pool so that it stays unaffected by swimming pool systems. Protective pads should be versatile so that they fit all positions where comfort is desired for your ladder. They should also be skid resistant so that they do not slip from under ladders when wet. Being one of the most voted best protective pads, it assures safety for vinyl lined pools. It is thick enough to hold most ladders and steps without them digging into it. It is a classic in protecting your pool against scratches and tears caused by rough based steps and ladders. 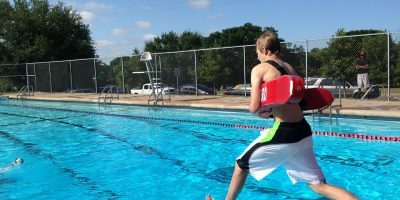 Measuring 30 by 36 inches, its versatility shows it can be used from inside and outside the pool, as some users prefer to use it for their ladders located outside the pool. It is constructed from rugged material; thus it keeps your ladder or steps from skidding. It is simple to set up with the help of water goggles, and you’ll get it under your entry system in no time. This pad is a very affordable piece that will save your pool from impact brought about by constant pushing and pulling by ladders and steps against the pool lining. Is it for an in-ground or above ground pool? 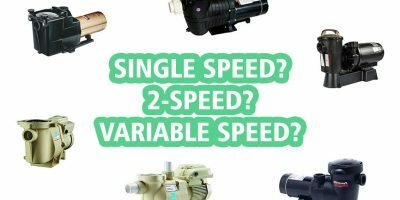 You’ll want to purchase a model made specifically for your pool type. In-ground pool steps and ladders are designed for the deeper end so that they can help users to enter and exit the pool safely. They may have up to five treads depending on the depth of the pool. You’ll want to consider a system made from corrosion resistant material like resin and stainless steel. The system installed should also showcase slip resistant qualities like aluminum reinforced treads or plastic. Above ground pool entry systems are essential because the disabled and seniors cannot access this pool without the help of stairs or ladders. There are many choices for the above ground swimming pool. First, you should consider the locking design such that the ladder interlocks well with your pool to avoid slipping into spaces between the pool and the ladder or steps. Steps are known to be more stable since they are wider and heavier. They are ideal for in-ground pools. They can be used by the elderly and are also known to hold quite some weight. If you have an in-ground pool made of concrete, installing permanent steps during its construction is a better option. Ladders, on the other hand, are versatile for above-ground pools since they come in different designs to fit your pool shape, size, and material that makes your pool. They are mostly A-shaped and can have steps on the inside or the outside, or both ways. Since they are vertical, they are not ideal for the elderly or disabled persons because one needs to use their weight for support. Remember to get the dimensions of your pool so that the entry system can sit well and provide absolute safety for users. You can easily use a tape measure for this. The steps or ladder you choose should have an adjustable height so that it can fit various depths of the pool, while still being used by the whole family. Above ground pools that don’t have decks will mostly benefit from adjustable ladders that can be locked away when the pool is not in use. The entry system you choose should have the ability to support heavier people so that they can also enjoy using the pool. Choose sturdy designs that are built with a resilient material like steel and aluminum. A system that indicates it is heavy-duty is going to offer more service because it will provide comfort when stepping without worry that it may give. Manufacturers consider the weight capacities of entry systems, but it’s always good to ask before buying. The most critical deliberation you can make is how far you can go in protecting users of your pool. Children, the elderly and handicapped are the most significant people to consider when purchasing a pool entry system. Users indicate that A-ladders may trap children behind them. The system that prevents anyone from swimming behind them will be the most ideal. Also, for the elderly, it’s important to consider ladders and steps with durable material that is slip resistant to avoid tripping and drowning especially, when no one is watching. With the information presented in this article, we hope you will make a choice out of knowledge of the products. It is important to maintain steps and ladders as the entry systems of our pools. Without them, safety will be compromised causing unwarranted accidents which would have been easily avoided. It is also important to supervise children when using these systems since they may get themselves stuck under the rails. We hope that you’ll take home the safest product and remember: high costs do not always equate better quality.